#1. This week's number one is an international guard Buddy Hield (193-93, college: Oklahoma, currently plays in NBA). 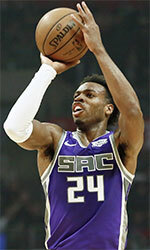 He led Sacramento Kings to a 2-point victory over the Detroit Pistons (20-25) 103-101 in the NBA in Saturday night's game. Hield was MVP of the game. He recorded 35 points (!!! ), 9 rebounds and 3 assists in 38 minutes on the court; quite an impressive performance considering it's only Hield's third season in pro basketball. The Sacramento Kings have 24-22 record this season. Hield has individually a very good year with high stats. He averages: 20.5ppg, 4.9rpg, 2.2apg, 2FGP: 50.4%, 3FGP: 45.6%(156-342) and FT: 86.4% in 46 games he played so far. 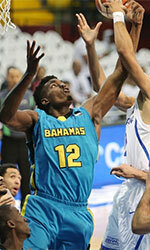 Hield is currently a member of the Bahamas senior national team. #2. Second place goes to former international center DeAndre Ayton (216-98, college: Arizona, currently plays in NBA). He could not help the Phoenix Suns (11-37) in their last game. Despite Ayton's very good performance the Phoenix Suns (11-37) were edged 111-109 at home by the Toronto Raptors. He had a double-double by scoring 15 points and getting 17 rebounds. Ayton also added 2 blocks in 35 minutes; not bad, considering it's only his third season in pro basketball. It was Suns' fourth consecutive loss in a row. It's Ayton's first year with the team. Ayton has very impressive stats this season: 16.4ppg, 10.6rpg, 2.0apg, 2FGP: 59.6%(337-565) and FT: 76.8% in 47 games. He played for the Bahamas national team in 2016. #3. The Bahamas player who performed third best last week abroad was an experienced former international power forward Christopher Turnquest (204-83, college: Miles CC, currently plays in Spain). Turnquest was not able to help Arenys (8-6) in their last game on Saturday. Despite his good performance the fourth-placed Arenys (8-6) was badly defeated 94-74 on the road by the lower-ranked Andorra II (#8) in the Group C-B. Turnquest recorded a double-double by scoring 13 points and getting 14 rebounds. This season Turnquest has very high stats. He averages: 16.4ppg, 10.9rpg, 2FGP: 55.9%(85-152), 3FGP: 23.1% and FT: 77.4%. Turnquest played for the Bahamas national team thirteen years ago. #4. Forward David Nesbitt (200-91, college: St.Thomas, FL, currently plays in Brazil) was not able to secure a victory for Flamengo (8-2) in their game against Pinheiros (13-3) in the Brazilian NBB. He did not have that impressive stats last Monday. Nesbitt recorded only 2 points and grabbed 5 rebounds in 18 minutes. Flamengo lost 73-81 in Sao Paulo to the second-ranked Pinheiros. It's Nesbitt's first season with the team. This year his overall stats are: 7.4ppg and 5.1rpg in 15 games. Nesbitt is also Bahamas national team player. #5. International forward Kentwan Smith (203-91, college: Stetson, currently plays in Denmark) led Naestved to a victory against the leader EBAA (8-1) 87-75 in the Danish BasketLigaen on Wednesday night. He recorded 12 points, 5 rebounds and 4 assists. It was the game of the round between two top 3 ranked teams in group ProA. Team FOG Naestved (11-7) is placed third. It was his team's third consecutive victory in a row. Smith's total stats this season are: 8.7ppg, 4.8rpg and 1.2apg. He plays currently for the Bahamas national team. #6. Power forward Kadeem Coleby (206-89, college: Wichita St., currently plays in Japan) couldn't help Akita Happinets (11-21) in their game against Toyota Alvark (21-11) in the Japanese B League, despite his very good performance in Wednesday night's game. He had a double-double by scoring 14 points and getting 12 rebounds in 25 minutes. But Akita Happinets (#5) lost 72-81 in Tokyo to the higher-ranked (#3) Toyota Alvark in the East group. It was Akita Happinets' third consecutive loss in a row. Coleby has relatively good stats this year: 13.3ppg, 9.3rpg, 1.4apg and 2.4bpg in 29 games. Worth to mention Coleby played also at Eurobasket Summer League, which helped him get the job in pro basketball. He is an international player who is currently on the senior Bahamas National Team roster. #7. International center Zane Knowles (208-92, agency: Octagon Europe, college: Texas A&M-CC, currently plays in France) couldn't help C'Chartres (8-2) in their game against JA Vichy (11-4) in the French ProB (second division), despite his very good performance on Friday night. He was the second best scorer with 20 points. Knowles also added 9 rebounds and dished 4 assists in 27 minutes. But the league leader C'Chartres was edged 104-103 in Vichy by the second-ranked JA Vichy. Knowles has very impressive stats this year: 16.7ppg, 7.0rpg, 1.3apg and 1.3bpg in three games. He is also Bahamas national team player. #8. Guard Oswald Parker (193-97, currently plays in NCAA2) couldn't help the Adelphi University (3-4) in their game against the Merrimack College in the NCAA2. Despite his very good performance in Tuesday night's game Parker recorded a double-double by scoring 15 points and getting 10 rebounds. He also added 4 assists. This season Parker has relatively solid stats: 10.8ppg, 5.1rpg and 2.0apg. He used to play for the Bahamas U16 national team back in 2013. #9. International forward Travis Munnings (198-94, currently plays college basketball in the States) contributed to La-Monroe's victory against the University Louisiana at Lafayette 99-95 in the NCAA last Saturday. Munnings scored 11 points, grabbed 8 rebounds and dished 5 assists in 37 minutes. The University of Louisiana at Monroe has 3-2 conference record this season. Munnings is one of the most experienced players in a team as it's his fourth year in La-Monroe's roster. He has reliable stats this season: 13.1ppg, 7.2rpg and 2.5apg in 16 games. Munnings is also in the roster of the Bahamas national team. #10. Forward Jordan Wilson (196-96, currently plays in Canada) couldn't help the Dalhousie University (0-5) in their game against the Panthers (4-8) in the U Sports. Despite his very good performance on Sunday night He was the top scorer with 13 points. Wilson also added 5 rebounds, 3 assists and 3 steals. His team will play only one more game in the Regular Season. And that game will be critical. Wilson's total stats this season are: 6.3ppg, 4.2rpg and 1.8apg. He is a former U17 international player as six years ago he still played for the Bahamas national team. #11. International point guard Jaron Cornish (180, currently studies in the States) contributed to a 3-point Stony Brook's victory against the University of Maine 64-61 in the NCAA in Saturday night's game. Cornish scored 6 points, grabbed 8 rebounds and dished 10 assists in 33 minutes. This year Cornish's total stats are: 8.2ppg, 3.9rpg and 3.4apg in 18 games. He plays currently for the Bahamas national team. #12. Former U16 international guard Shamar Burrows (190-97, currently plays in Canada) is a teammate of previously mentioned Jordan Wilson and both played together in the last U Sports game. Burrows couldn't help the Dalhousie University in their game against the Panthers. He recorded 7 points and grabbed 7 rebounds in only 13 minutes. His team was edged 70-67. Burrows has averaged so far 1.9ppg and 1.1rpg in 10 games. He used to play for the Bahamas U16 national team back in 2013. #13. Former U17 international forward Charles Bain (203-96, is currently at the American university) contributed to a Robert Morris' victory against the Bryant University 79-65 in the NCAA on Saturday night. Bain scored 7 points and grabbed 4 rebounds. He averaged so far 10.2ppg and 4.2rpg. Bain used to play for the Bahamas U17 national team six years ago. #14. Former U17 international forward Qyemah Gibson (196-97, currently plays in Canada) helped Saint Mary's University win their game against the Tigers 69-63 in a derby game in the U Sports on Tuesday night. Gibson scored 8 points in only 11 minutes. He has averaged so far 6.9ppg and 2.8rpg in 11 games. Gibson used to play for the Bahamas U17 national team back in 2013. #15. Former U17 international forward Philip McKenzie (196-98, currently plays college basketball in the States) couldn't help the Houston Baptist in their game against the Abilene Christian University in the NCAA. He scored 5 points. His team was defeated 75-68. McKenzie has averaged so far 8.2ppg and 5.5rpg. He used to play for the Bahamas U17 national team four years ago. #1. Klay Thompson (201-G-90, college: Washington St., currently plays in NBA) was the major contributor in a Golden State Warriors' victory against the Denver Nuggets (31-14) crushing them 142-111 in the NBA last Tuesday. He scored 31 points (!!!) and had 3 steals. The Golden State Warriors have a solid 32-14 record this season. It was his team's seventh consecutive victory in a row. It's Thompson's eighth year with the team. Thompson has individually a very good season with high stats. He averages: 21.6ppg, 4.2rpg, 2.0apg and 1.2spg. Thompson has a dual citizenship: Bahamas and American. #2. Azaro Roker (198-F, currently plays in Canada) led St. Francis Xavier to a victory over the Panthers (4-8) 78-74 in the U Sports last Friday. Roker was the best player in that game. He recorded a double-double by scoring 17 points and getting the same number of rebounds. Roker also added 4 assists and 2 blocks. The St. Francis Xavier has 4-7 record this season. It was his team's first victory after four consecutive loses. There are only two games left until the end of the Regular Season. So now every game will be critical. This season Roker has relatively solid stats: 11.3ppg, 11.0rpg and 2.4bpg. #3. Radshad Davis (188-G, currently plays college basketball in the States) contributed to an Texas Arlington's victory against the Arkansas State University (2-3) 68-59 in the NCAA last Thursday. Davis scored 10 points and grabbed 4 rebounds. The University of Texas at Arlington has a solid 4-2 conference record this season. Davis has averaged so far 7.6ppg and 5.8rpg. #4. Trevon Grant (185-G, currently plays in Canada) could not help the Acadia University (9-3) in their last game. Despite his good performance the Acadia University (#3) lost 64-79 on the road to the Varsity Reds. Grant was the top scorer with 12 points in 30 minutes. There are only two games left until the end of the Regular Season. So now every game is very crucial. Grant's stats this year are: 12.1ppg, 7.4rpg, 2.9apg and 1.9spg in 11 games he played so far. #5. Nathan Bain (198-F, currently studies in the States) was not able to help the SF Austin in their game against the University of New Orleans (1-5) in the NCAA. He scored 7 points and grabbed 5 rebounds. his team was defeated 68-61 at home by the University of. Bain has been at the team for four years. Bain has averaged so far 6.0ppg, 4.8rpg, 1.3apg and 1.1spg. #6. Winslo Barry (208-F-90, college: Incarnate Word, currently plays in Spain) was not able to secure a victory for Naron in their game against Culleredo in the Spanish EBA (fourth division). He was the second best scorer with 9 points. Barry also added 7 rebounds in 25 minutes. His team was crushed by 21 points 75-54. He has averaged so far 9.0ppg and 6.6rpg in eight games. #7. Shaquillo Fritz (203-F-94, is currently at the American university) couldn't help the Arkansas St. in their game against the Texas State University at San Marcos in the NCAA. Fritz scored only 4 points, grabbed 4 rebounds and made 3 blocks. His team was defeated 77-64. He has averaged so far 1.0ppg and 1.4rpg. #8. Willis Mackey (203-F, currently plays in NAIA) couldn't help the University of Northwestern Ohio in their game against the Siena Heights University in the WHAC, despite his very good performance last Sunday. Mackey scored 17 points and grabbed 6 rebounds in 29 minutes. But his team lost 78-85 in the WHAC. He has averaged so far 8.2ppg and 5.5rpg in 15 games. #9. Aaron Levarity (198-F, currently plays in NAIA) contributed to an easy victory against the St. Andrews University crushing them 91-62 in the AAC on Saturday night. Levarity recorded a double-double by scoring 26 points and getting 13 rebounds. He also added 4 assists and 2 blocks. This season Levarity has very high stats. He averages: 15.3ppg, 8.5rpg and 1.5apg.